Tank! Tank! Tank! had a ton of potential, but ultimately ends up being boring, shallow and tedious. Skip this one. 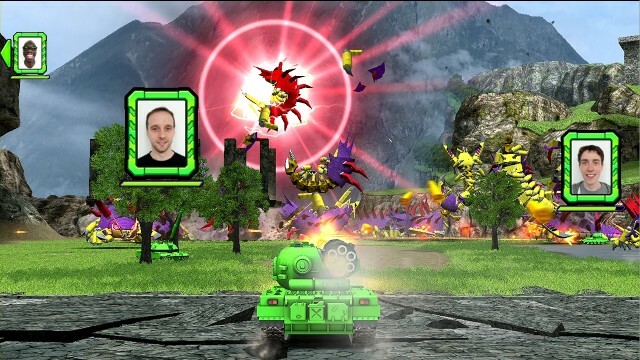 “Oh cool!” I said as myself and Chad split up the Wii U games for review, and I saw the exact trailer above for Tank! Tank! Tank! “This looks like it could be good!” Giant robot enemies, co-op tank battles, customizable weaponry and a cartoony arcade experience? What could possibly be bad about that? First, the game will henceforth be known as “Tanks” in this review, because it’s just annoying to keep writing all the exclamation points. Plus, the game isn’t as exciting as the generous amounts of punctuation make it seem. Tanks is a simple premise. 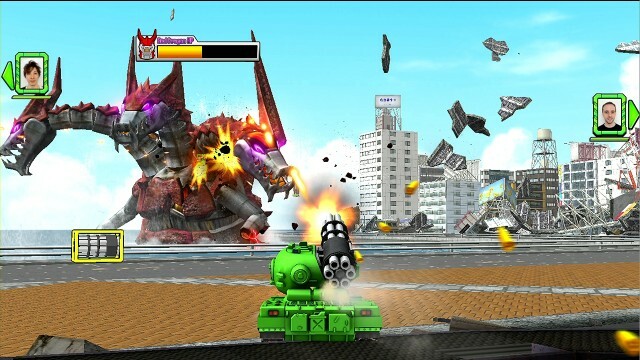 There are giant robot things attacking the city, you need to attack them. With a tank. Because, you know, that’s what the game is called. You’ll play level after level of defeating giant robot dragons, gorillas, spiders, basically the entire animal kingdom in giant robot form. Each level has a set time limit in which players must slay so many smaller enemies or one giant one. Levels begin with the player picking which tank they’d like to use, which are unlocked through completing missions and earning medals. Each tank has its own strengths and specialized skill set. One tank might specialize in speed and long range fighting, while another might specialize in ballistics and armor. Once in the level players will move the tank with the left stick, right stick, the D-pad or by tilting the GamePad. Firing is literally every button on the controller that isn’t – or +. That means there’s no buttons left for switching out power-ups when picked up, or AIMING. That’s right, one of the best features of a tank – that you can move and aim in different directions – is completely non-existent here. Why? No idea. It’s not like they ran out of buttons to map things to or anything. There’s literally EIGHT buttons on the GamePad and all of them do the same thing here. There’s no real strategy to the battles themselves. It usually just ends up that you need to point your tank in the direction of whatever you want to die, hold the fire button and repeat until dead or the timer runs out. Dodge attacks if necessary. There’s a certain amount of thought that has to go into what tank you use, since you couldn’t take on a flying enemy with, say, a tank that can only fire a few feet in front of you, but you have no idea what kind of enemy you’re going to face when heading into each individual level, so the only strategy that could have been made has been terminated. And since there’s really no set strategy, and enemies don’t really have a “weak point” per se, you might have to replay levels over and over again if you can’t vanquish your enemy within the time limit. You’ll frantically run around trying to collect power-ups in different combinations because it’s really the only wildcard in any of the levels. But what really infuriates me is the way the levels are laid out. After about a half dozen levels you’re told that you need more medals in order to progress, which I previously mentioned are only obtained by completing levels. You can earn additional medals per level by finishing the level with different tanks. This wouldn’t be such a bad idea, but as I previously mentioned, certain levels seem almost tailor-made for specific tanks, so you’d be jumping into battle with the wrong tools. Not only that, but the tank’s stats increase individually, which means that if you’ve been playing through a majority of levels with only one tank, playing certain levels with one you haven’t even touched yet will be more difficult and weaker. And when you finally get enough levels to progress, you have to do the whole song and dance over again in another few levels, creating an eternal cycle of boredom, frustration and lack of any real depth. Why would I go back and play levels that weren’t fun in order to unlock more levels that probably aren’t fun? Especially when the levels I’m replaying are made MORE not fun by the fact you’re going in with equipment you probably haven’t used before? This is madness. To be fair, Tanks is meant to be a party game, and is slightly better when playing with multiple people than it is alone. 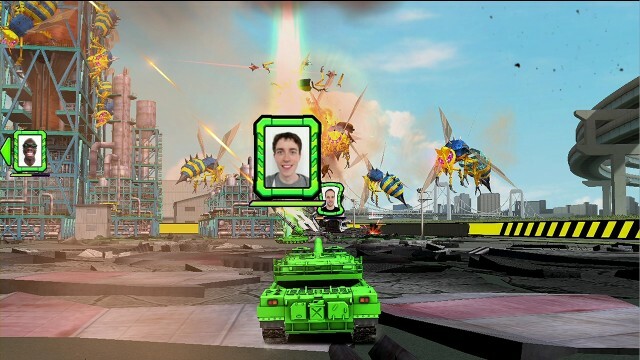 A variety of modes will see players face each other individually, in teams and as one player taking on the form of a giant robotic gorilla. It’s a simple arcade experience that’ll be fun for a few rounds, but you and your friends will quickly want to pick up something with a little more substance. Tanks may be good as a quick time-waster while you’re waiting for the new episode of The Walking Dead to come on, but doesn’t deserve to be thrust upon people at the full price it comes at. There’s a reason this game has previously only been available at arcades, because it’s more fun to dump a few quarters in a machine to play this game than it is to drop $50 on having it in disc form. Tanks has absolutely no redeeming factor. It’s boring, repetitive, shallow, uninteresting, poorly designed, infuriating, and a handful of other descriptors I can’t even come up with words for. This is the kind of game you’ll see in the bargain bins before the year is even over, look at it, think about it, then realize that even the Wii U’s karaoke game seems more appealing. There’s at least six games out for Wii U right now that are worth playing, Tank! Tank! Tank! isn’t one of them.